Save The Dates For Sensory Friendly Fun! 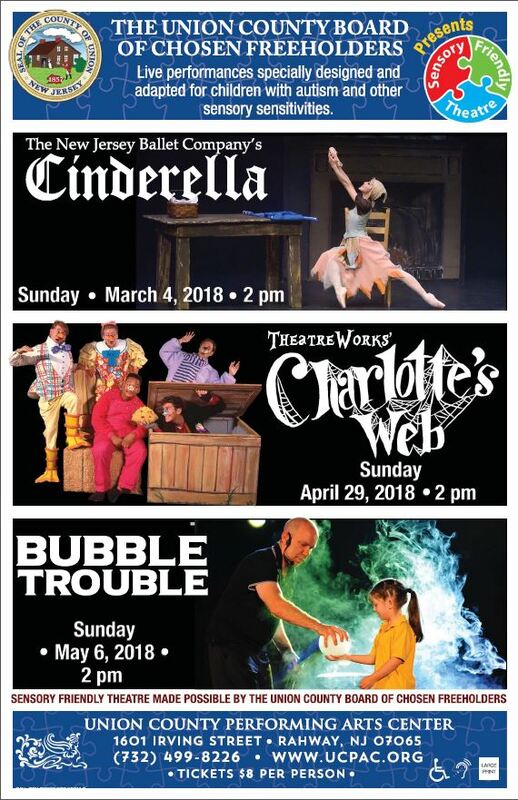 Union County, NJ – The Union County Board of Chosen Freeholders is pleased to announce the spring season of Sensory Friendly Theatre at the Union County Performing Arts Center in Rahway. The popular series, sponsored by the Freeholder Board, showcases exciting live performances in an environment tailored to audiences with autism and other sensory sensitivities. Since 1958, New Jersey Ballet has brought the joy and beauty of dance to the entire state, and had the distinct privilege to represent New Jersey in other parts of the country and world. The Ballet has an extensive repertory, which embraces the classics, as well as contemporary works. Making dance accessible to everyone requires affordable ticket prices. New Jersey Ballet is proud to be designated a Major Arts Institution by the New Jersey State Council on the Arts. Theatreworks’ production of Charlotte’s Web is based on E.B. White’s loving story of the friendship between a pig named Wilbur and a little gray spider named Charlotte. Wilbur has a problem: how to avoid winding up as pork chops! Charlotte, a fine writer and true friend, hits on a plan to fool Farmer Zuckerman — she will create a “miracle.” This treasured tale, featuring mad-cap and endearing farm animals, explores bravery, selfless love, and the true meaning of friendship. A bubble volcano. Bubble roller coaster. A kid in a bubble? Jeff Boyer takes bubbles to the max in this one-man bubble extravaganza. It’s the craziest, most creative bubble show around. Jeff juggles bubbles, sculpts and builds with bubbles, makes fog-filled bubbles and more. Mixing comedy, music and a unique level of community participation, he engages and delights audiences of all ages. The Sensory Friendly Theatre series began in 2012 as an initiative of Freeholder Alexander Mirabella. It is designed according to guidelines that help reduce disturbances for youngsters who experience heightened sensory sensitivity. It has been supported by the Freeholder Board every year since then. For each of the Sensory Friendly performances, the environment at the Union County Performing Arts Center is adjusted to provide a sensory-friendly, comfortable and judgment-free space that is welcoming for all families. Autism Friendly Spaces implements the supportive atmosphere at the performances. For more information on what to expect at Sensory Friendly Theatre visit ucpac.org/sensory-friendly-theatre. All tickets for are $8.00 per person and can be purchased through the Union County Performing Arts Center at ucpac.org or by calling the box office at 732-499-8226. The Union County Performing Arts Center and box office are located at 1601 Irving Street in Rahway.